Neutrinos are subatomic particles produced by the decay of radioactive elements or in collisions of energetic nuclear particles. They carry no electric charge. Neutrinos are the most abundant massive particles in the universe: each cubic centimeter of the cosmos contains 340 neutrinos, which are relicts of the Big Bang. Their unique advantage arises from a fundamental property: They are affected only by the weakest force of nature (but gravity). It is the feeble interaction of neutrinos with matter that makes them uniquely valuable as astronomical messengers. Unlike photons or charged particles, neutrinos can emerge from deep inside their sources and travel across the universe without interference. They are not deflected by interstellar magnetic fields and are not absorbed by intervening matter. However, this same trait makes cosmic neutrinos extremely difficult to detect; immense instruments are required to find them in sufficient numbers to trace their origin. 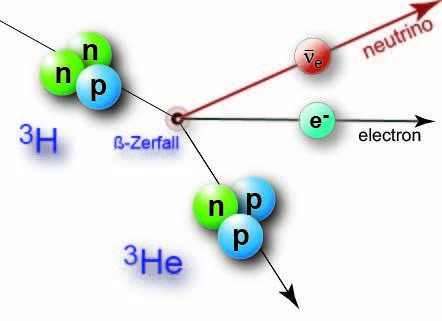 Detectors measure the pure neutrino flavors νe , νµ , ντ , which are mixtures of mass states (ν1 , ν2 , ν3). The differences among the mixed states have been measured but the masses themselves are unknown. mixed states or between the second heaviest and the lightest ones. Neutrinos appear in three species: electron neutrinos, muon neutrinos and tau neutrinos. In the Standard Model, neutrinos have no mass. A major breakthrough of the past decade has been the discovery that neutrinos, on the contrary, are massive. The massless neutrino assumption was questioned when electron neutrinos were shown to disappear on their way from the Sun to the Earth. As we know today, the electron neutrinos change their identity to one of the other species, the latter escaping detection. A similar effect popped up in the Earth’s atmosphere: neutrinos produced by cosmic rays change their species during their trip to the detector. This change is dubbed neutrino oscillations, or mixing, and it can occur only if neutrinos have a mass. Therefore, oscillations herald first physics beyond the Standard model. Experiments at nuclear reactors and accelerators have confirmed these findings and also provided independent knowledge about the strength by which the three neutrino species mix with each other. Unfortunately, oscillations are unable to provide us with the values of these three masses: we only have access to the differences between the squares of any pair of them. On left is pictured standard beta decay with an atom of Tritium. In standard double beta decay (middle), two neutrons become protons by emitting two electrons (beta particles) and two neutrinos. If neutrinos are their own antiparticles, however, an antineutrino emitted in one decay can be absorbed as a neutrino in the other, resulting in a neutrinoless double beta decay (right). 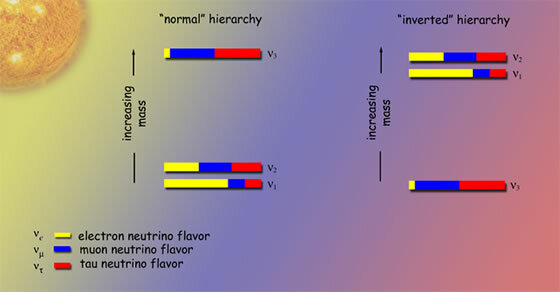 From the oscillation pattern, the mass differences between different neutrino states can be inferred, but neither the absolute values of their masses, nor the form of their mass hierarchy. The absolute values of neutrino masses are determined by measuring the electrons from tritium beta decay, where a neutron inside a nucleus transforms into a proton, an electron and an antineutrino. From these experiments we know, that the heaviest of the three neutrinos is lighter than 2.3 eV, i.e., about 4 millionth of the electron mass. Neutrinos as their own antiparticles: Majorana neutrinos? Another class of experiments search for “neutrino-less double beta decay” and may tell us whether neutrinos are their own antiparticles (Majorana neutrinos) – a discovery going well beyond the precision measurement of their absolute masses. The consequences of a possible Majorana nature of neutrinos would be fundamental. It is, for instance, the condition that a process in the Big Bang phase called leptongenesis leads to the observed dominance of matter over antimatter in the Universe. the supernova explosion at the center of the inner ring. High energy neutrinos must be emitted as a by-product of high energy collisions of charged cosmic rays with matter. Since they can escape much denser celestial bodies than light, they can be tracers of processes which stay hidden from traditional astronomy. On the other hand, their extremely low interaction probability makes their detection extraordinarily difficult. Detectors for solar neutrinos are buried deep underground in order to shield them against noise which could mimic their rare interactions. Only neutrinos can penetrate deep enough to reach these devices undisturbed. And whereas neutrino astronomy in the energy domain of 1 MeV (1 MeV = 106 eV) has been established with the impressive observation of solar neutrinos and neutrinos from supernova SN 1987A, neutrinos with energies of 1 GeV (1 GeV = 109 eV) and above, which must accompany the production of high energy cosmic rays, still await discovery. In order to detect the low fluxes from the suspected distant sources of high-energy neutrinos of 1 Tev (1 TeV= 1012 eV) and 1 PeV (1 PeV = 1015 eV), immense detectors of cubic kilometer volume are required. 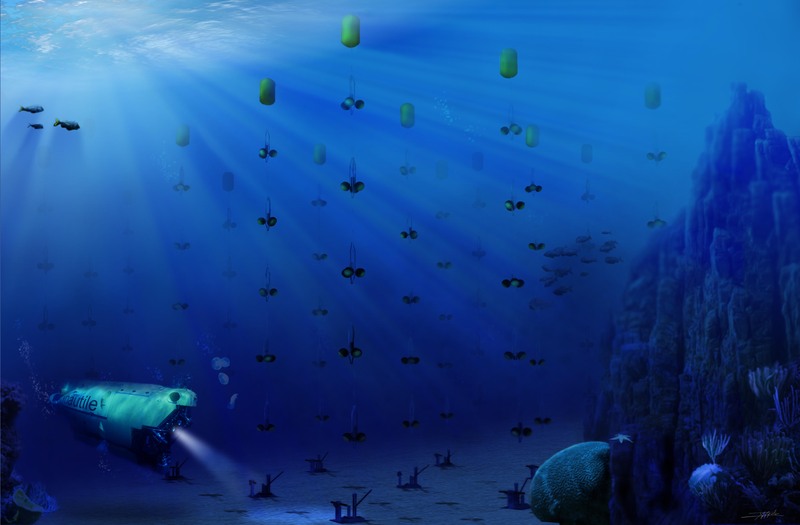 Since they cannot be arranged underground, the expandable arrays are built deep in open water, oceans or lakes, or in ice where available space is no issue.